The Creative Writer's Desk is here to help you become a better writer. If you're looking for a no-fluff resource for writing advice and help, this is the place for you. Whether writing is your career, hobby, or passion there's always room to improve or expand on your foundation of knowledge and skills. This collection of articles gives you a well rounded foundation of ideas which you can take as they are or adapt for your own specific needs. Browse through these pages for help and ideas that you can apply to all of your creative writing problems... and while you're here you might just learn how to avoid problems in the future. Without a system, a method of writing, no writer will ever graduate beyond the level of amateur. That system has to be more than habit, it needs to become a Ritual. It needs to be internalized and automatic so the writer can focus on the real task at hand. Developing these rituals takes a little time and practice but the payoff can change your life. If you're never paid a cent for anything you write, does that make you a bad writer? Or, on the other hand, if you're paid well for every sentence you write, does that make you an artistic sell out? No. Of course not. As long as you find writing enjoyable and rewarding, it doesn't matter how much or how little you're getting paid to do it. If you haven't sold anything or don't want to, writing can be a reward in itself. And if you are selling your words, the better you master the art of writing, the better you're paid. 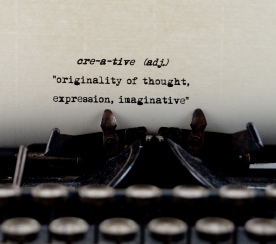 Creative writing is both a form of communication and an art. It's both an elementary skill and carefully trained craft. But whether you're doing it for love or money, it's always rewarding to learn more about the craft. The articles here should help you on your path to becoming a better writer. Surf around and enjoy. Thanks for visiting the Creative Writer's Desk. 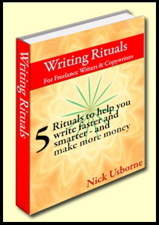 Get Your FREE Ebook How To Write And Get Paid For It when you join our mailing list. Want to check out the back issues to see what the Creative Writer's Ezine is all about? Visit the Creative Writer's Ezine Archives. Writing Creative Nonfiction is difficult until you learn the tricks . It combines aspects of imaginative writing with journalistic reporting. This page offers articles and advice for better writing. Some days the muse seems to sit on our shoulders and other days we can’t find it no matter where we look. Luckily, writer's block can be overcome with a push in the right direction. Knowing how to edit your writing is one of the core skills of any writer. The sad truth is that words just don't come out perfectly the first time. Learn how to make your writing say what you meant. Writing Creative Fiction. Helpful articles and tips for fiction writing, short stories, novels, and novellas. Author interviews and discussions with writers currently being published in the fields of Fiction and Creative Non-Fiction. Imagine working for yourself, setting your own schedule, and not EVER having to worry about pink slips... Now you can, and SBI can show you how.